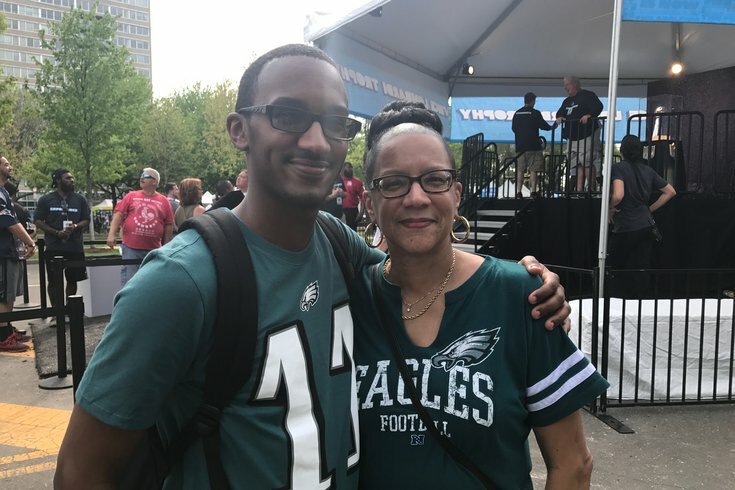 Austin Rylander, 24, poses with his mother, Sheila, 60, at the NFL Draft Experience, which opened Thursday on the Benjamin Franklin Parkway. Sheila Rylander and her son, Austin, were all smiles Thursday afternoon as they posed for a photo with the Vince Lombardi Trophy, the glistening silver trophy awarded to the Super Bowl champion each winter. 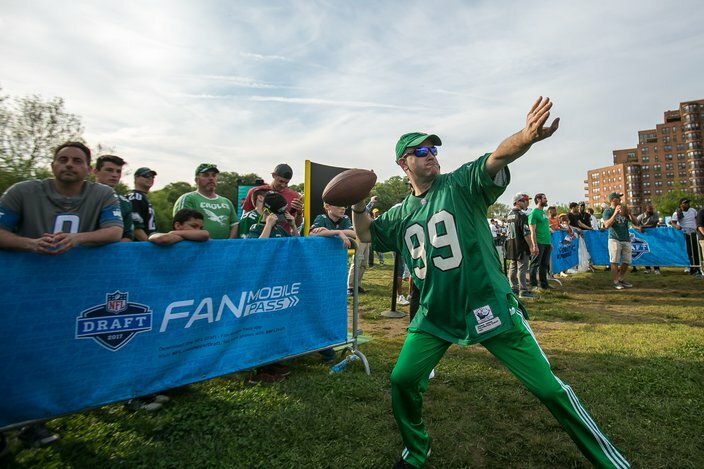 They were among hundreds of fans who had waited in line for a photo, one of numerous activities at the NFL Draft Experience, which opened Thursday on the Benjamin Franklin Parkway. "This is put together really well," said Sheila Rylander, 60, of Southwest Philadelphia. "There's a lot to do and a lot to see. There's also a lot of people." Thousands of football fans crowded onto the Parkway long before the Cleveland Browns were set to select the first player in the NFL draft. Most of them wore their favorite team's jersey as they examined football memorabilia, sought autographs or competed in a mock NFL tryout. Naturally, there were a lot of green jerseys. The Rylanders, wearing their Eagles gear, said they were going to come back early on Saturday to experience the activities they did not get around to completing Thursday afternoon. But they wanted to watch the first round of the draft, in which the Eagles will pick at No. 14, at home. "We're going to watch that from the comforts of our own home, where it's nice and cool," Sheila Rylander said. 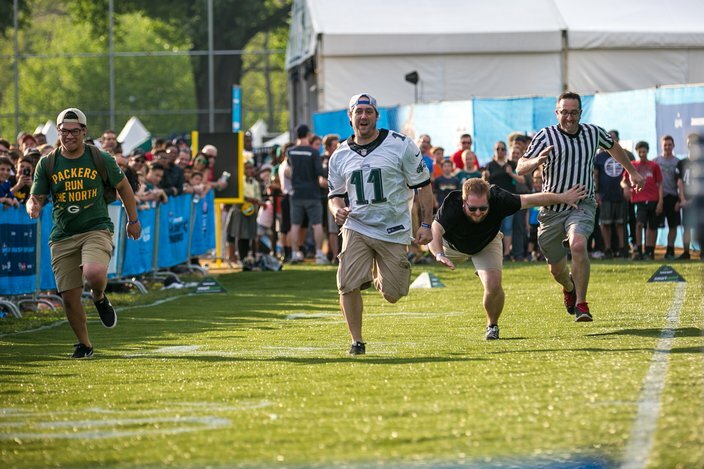 Football fans test their speed in the 40-yard dash at the 2017 NFL Draft, Thursday, April 27 in Philadelphia. 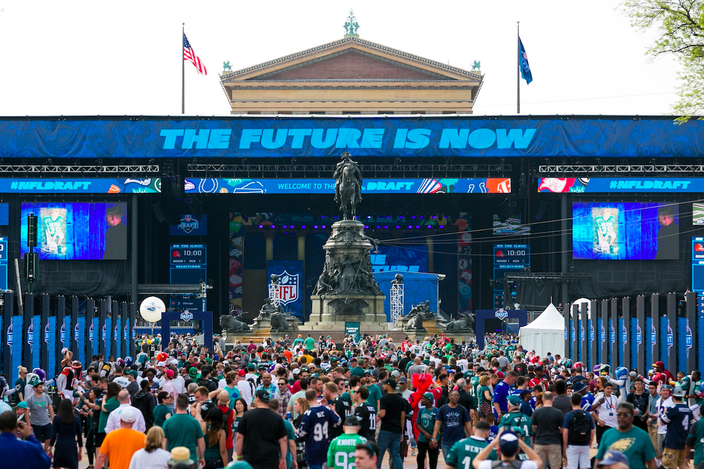 But thousands of fans are expected to remain on the Parkway when the NFL draft kicks off at 8 p.m. Until then, they busied themselves with the myriad experiences included in the festival-like atmosphere. A makeshift museum — not far from actual museums, by the way — featured eight busts of Hall of Fame football players, including former Eagles Chuck Bednarik, Reggie White and Steve Van Buren. The busts are typically on display at the Pro Football Hall of Fame in Canton, Ohio. Nearby, dozens of Eagles fans waited to enter an exhibit featuring Super Bowl rings. Fans could use magnifying glasses to get an up-close look at the sparkling diamonds included on the rings. "I don't understand what all these Eagles fans are doing?" joked Price Wise Hallwood, a New York Giants fan who kindly reminded a reporter that the Eagles have never won a Super Bowl. But Hallwood, 46, of Brooklyn, New York, stood impressed by the memorabilia included in the makeshift museum. "They offer you a quick glimpse (of Canton)," Hallwood said. "This is what I should expect to see." Elsewhere, hundreds of fans tested their football skills in competitions that mimic the NFL Combine, where collegiate football players are heavily critiqued by prospective NFL teams. Here, one Eagles fan booted a 40-yard field goal, drawing cheers from a crowd of onlookers. Mike Brown, of Maryland, takes a shot in the Hail Mary competition, part of the fan experience at the 2017 NFL draft, Thursday, April 27. Curtis Greer and Luke Hildenbrand, both Michigan natives, each tested their vertical jump, but found the other Combine events too crowded. They planned to return Friday to complete the events, which also include the 40-yard dash and throwing Hail Mary passes. But the Detroit Lions fans remained impressed by the atmosphere, particularly the draft stage, where NFL Commissioner Roger Goodell will announce each team's selection later Thursday night. The stage has been constructed on the steps to the Philadelphia Museum of Art, made famous by the movie character Rocky. "Just looking at the stage was really cool, with how it's built onto the steps," said Greer, 25, now of Lehigh Valley. "I'm excited for when the draft gets going." At Eakins Oval, located just in front of the stage, fans posed for pictures behind headless mannequins adorned with NFL uniforms. Nearby, a so-called "locker room" featured the uniforms of players around the league, including Eagles Carson Wentz and Fletcher Cox. Fans also could take photos with Eagles cheerleaders or listen live as WIP and The Fanatic broadcast their radio shows from Eakins Oval. WIP host Ike Reese even showed the onlookers his lucky pair of Eagles underwear. But many fans waited in anticipation of the main event — the NFL draft itself. Chris DeAngelis, 42, and Bryan Herring, 36, both of New Castle, Delaware, arrived shortly after the NFL Draft Experience opened Thursday. They quickly completed many of the activities listed on the NFL Draft's mobile app, which awards participants badges for completing myriad experiences. By 4 p.m., they were hoping to score standby tickets to be among the 3,000 fans on stage during the NFL draft. Last year, they were among the fans who gathered at Lincoln Financial Field on the night the Eagles selected Wentz, their quarterback of the future. "We got to every game," DeAngelis said. "We've been looking forward to this since they announced it." The event did not let them down. "It's impressive," Herring said. "I like that it's outdoors, especially because it's nice weather. You feel like you're in the city."